The CIE 1931 color spaces were the first defined quantitative links between distributions of wavelengths in the electromagnetic visible spectrum, and physiologically perceived colors in human color vision. 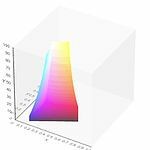 The mathematical relationships that define these color spaces are essential tools for color management, important when dealing with color inks, illuminated displays, and recording devices such as digital cameras. The CIE 1931 RGB color space and CIE 1931 XYZ color space were created by the International Commission on Illumination (CIE) in 1931. They resulted from a series of experiments done in the late 1920s by William David Wright and John Guild. The experimental results were combined into the specification of the CIE RGB color space, from which the CIE XYZ color space was derived. The CIE 1931 color spaces are still widely used, as is the 1976 CIELUV color space. The normalized spectral sensitivity of human cone cells of short-, middle- and long-wavelength types. The human eye with normal vision has three kinds of cone cells that sense light, having peaks of spectral sensitivity in short ("S", 420 nm – 440 nm), middle ("M", 530 nm – 540 nm), and long ("L", 560 nm – 580 nm) wavelengths. These cone cells underlie human color perception in conditions of medium and high brightness; in very dim light color vision diminishes, and the low-brightness, monochromatic "night vision" receptors, denominated "rod cells", become effective. 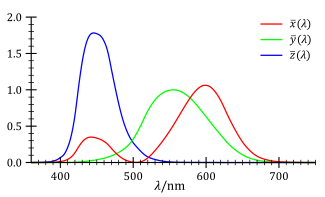 Thus, three parameters corresponding to levels of stimulus of the three kinds of cone cells, in principle describe any human color sensation. Weighting a total light power spectrum by the individual spectral sensitivities of the three kinds of cone cells renders three effective values of stimulus; these three values compose a tristimulus specification of the objective color of the light spectrum. The three parameters, denoted "S", "M", and "L", are indicated using a 3-dimensional space denominated the "LMS color space", which is one of many color spaces devised to quantify human color vision. A color space maps a range of physically produced colors from mixed light, pigments, etc. 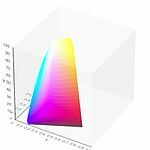 to an objective description of color sensations registered in the human eye, typically in terms of tristimulus values, but not usually in the LMS color space defined by the spectral sensitivities of the cone cells. The tristimulus values associated with a color space can be conceptualized as amounts of three primary colors in a tri-chromatic, additive color model. In some color spaces, including the LMS and XYZ spaces, the primary colors used are not real colors in the sense that they cannot be generated in any light spectrum. The CIE XYZ color space encompasses all color sensations that are visible to a person with average eyesight. That is why CIE XYZ (Tristimulus values) is a device-invariant representation of color. It serves as a standard reference against which many other color spaces are defined. 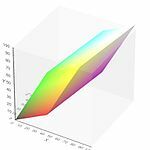 A set of color-matching functions, like the spectral sensitivity curves of the LMS color space, but not restricted to non-negative sensitivities, associates physically produced light spectra with specific tristimulus values. Consider two light sources composed of different mixtures of various wavelengths. Such light sources may appear to be the same color; this effect is denominated "metamerism". Such light sources have the same apparent color to an observer when they produce the same tristimulus values, regardless of the spectral power distributions of the sources. Most wavelengths stimulate two or all three kinds of cone cell because the spectral sensitivity curves of the three kinds overlap. Certain tristimulus values are thus physically impossible, for example LMS tristimulus values that are non-zero for the M component and zero for both the L and S components. 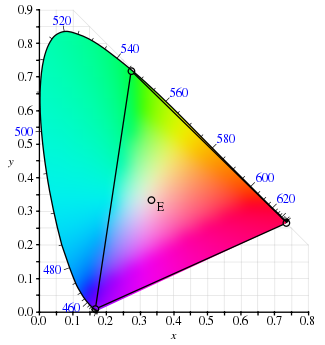 Furthermore, LMS tristimulus values for pure spectral colors would, in any normal trichromatic additive color space, e. g. the RGB color spaces, imply negative values for at least one of the three primaries because the chromaticity would be outside the color triangle defined by the primary colors. To avoid these negative RGB values, and to have one component that describes the perceived brightness, "imaginary" primary colors and corresponding color-matching functions were formulated. The CIE 1931 color space defines the resulting tristimulus values, in which they are denoted by "X", "Y", and "Z". In XYZ space, all combinations of non-negative coordinates are meaningful, but many, such as the primary locations [1, 0, 0], [0, 1, 0], and [0, 0, 1], correspond to imaginary colors outside the space of possible LMS coordinates; imaginary colors do not correspond to any spectral distribution of wavelengths and therefore have no physical reality. A comparison between a typical normalised M cone's spectral sensitivity and the CIE 1931 luminosity function for a standard observer in photopic vision. When judging the relative luminance (brightness) of different colors in well-lit situations, humans tend to perceive light within the green parts of the spectrum as brighter than red or blue light of equal power. 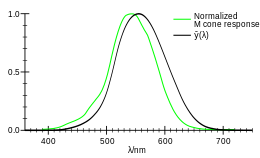 The luminosity function that describes the perceived brightnesses of different wavelengths is thus roughly analogous to the spectral sensitivity of M cones. The CIE model capitalises on this fact by setting Y as luminance. Z is quasi-equal to blue, or the S cone response, and X is a mix of response curves chosen to be nonnegative. The XYZ tristimulus values are thus analogous to, but different from, the LMS cone responses of the human eye. Setting Y as luminance has the useful result that for any given Y value, the XZ plane will contain all possible chromaticities at that luminance. The unit of the tristimulus values X, Y, and Z is often arbitrarily chosen so that Y = 1 or Y = 100 is the brightest white that a color display supports. The corresponding whitepoint values for X and Z can then be inferred using the standard illuminants. Due to the distribution of cones in the eye, the tristimulus values depend on the observer's field of view. To eliminate this variable, the CIE defined a color-mapping function called the standard (colorimetric) observer, to represent an average human's chromatic response within a 2° arc inside the fovea. This angle was chosen owing to the belief that the color-sensitive cones resided within a 2° arc of the fovea. Thus the CIE 1931 Standard Observer function is also known as the CIE 1931 2° Standard Observer. A more modern but less-used alternative is the CIE 1964 10° Standard Observer, which is derived from the work of Stiles and Burch, and Speranskaya. For the 10° experiments, the observers were instructed to ignore the central 2° spot. The 1964 Supplementary Standard Observer function is recommended when dealing with more than about a 4° field of view. Both standard observer functions are discretized at 5 nm wavelength intervals from 380 nm to 780 nm and distributed by the CIE. All corresponding values have been calculated from experimentally obtained data using interpolation. The standard observer is characterized by three color matching functions. The derivation of the CIE standard observer from color matching experiments is given below, after the description of the CIE RGB space. The CIE standard observer color matching functions. are the numerical description of the chromatic response of the observer (described above). They can be thought of as the spectral sensitivity curves of three linear light detectors yielding the CIE tristimulus values X, Y and Z. Collectively, these three functions are known as the CIE standard observer. Other observers, such as for the CIE RGB space or other RGB color spaces, are defined by other sets of three color-matching functions, and lead to tristimulus values in those other spaces. The values of X, Y, and Z are bounded if the radiance spectrum Le,Ω,λ is bounded. The reflective and transmissive cases are very similar to the emissive case, with a few differences. The spectral radiance Le,Ω,λ is replaced by the spectral reflectance (or transmittance) S(λ) of the object being measured, multiplied by the spectral power distribution of the illuminant I(λ). The CIE 1931 color space chromaticity diagram. The outer curved boundary is the spectral (or monochromatic) locus, with wavelengths shown in nanometers. Note that the colors your screen displays in this image are specified using sRGB, so the colors outside the sRGB gamut are not displayed properly. Depending on the color space and calibration of your display device, the sRGB colors may not be displayed properly either. This diagram displays the maximally saturated bright colors that can be produced by a computer monitor or television set. 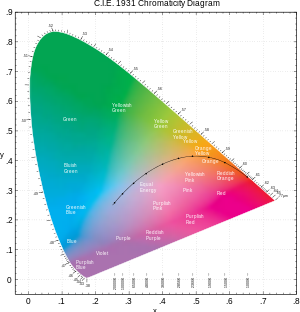 The CIE 1931 color space chromaticity diagram rendered in terms of the colors of lower saturation and value than those displayed in the diagram above that can be produced by pigments, such as those used in printing. The color names are from the Munsell color system. The solid curve with dots on it, through the middle, is the Planckian locus, with the dots corresponding to a few select black-body temperatures that are indicated just above the x-axis. The derived color space specified by x, y, and Y is known as the CIE xyY color space and is widely used to specify colors in practice. The figure on the right shows the related chromaticity diagram. The outer curved boundary is the spectral locus, with wavelengths shown in nanometers. Note that the chromaticity diagram is a tool to specify how the human eye will experience light with a given spectrum. It cannot specify colors of objects (or printing inks), since the chromaticity observed while looking at an object depends on the light source as well. Mathematically the colors of the chromaticity diagram occupy a region of the real projective plane. The diagram represents all of the chromaticities visible to the average person. These are shown in color and this region is called the gamut of human vision. The gamut of all visible chromaticities on the CIE plot is the tongue-shaped or horseshoe-shaped figure shown in color. The curved edge of the gamut is called the spectral locus and corresponds to monochromatic light (each point representing a pure hue of a single wavelength), with wavelengths listed in nanometers. The straight edge on the lower part of the gamut is called the line of purples. These colors, although they are on the border of the gamut, have no counterpart in monochromatic light. Less saturated colors appear in the interior of the figure with white at the center. It is seen that all visible chromaticities correspond to non-negative values of x, y, and z (and therefore to non-negative values of X, Y, and Z). If one chooses any two points of color on the chromaticity diagram, then all the colors that lie in a straight line between the two points can be formed by mixing these two colors. It follows that the gamut of colors must be convex in shape. All colors that can be formed by mixing three sources are found inside the triangle formed by the source points on the chromaticity diagram (and so on for multiple sources). An equal mixture of two equally bright colors will not generally lie on the midpoint of that line segment. 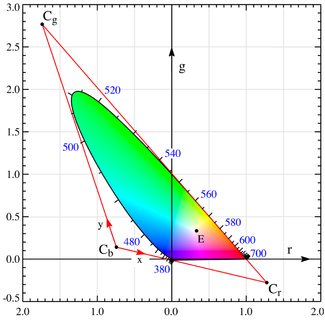 In more general terms, a distance on the CIE xy chromaticity diagram does not correspond to the degree of difference between two colors. In the early 1940s, David MacAdam studied the nature of visual sensitivity to color differences, and summarized his results in the concept of a MacAdam ellipse. Based on the work of MacAdam, the CIE 1960, CIE 1964, and CIE 1976 color spaces were developed, with the goal of achieving perceptual uniformity (have an equal distance in the color space correspond to equal differences in color). Although they were a distinct improvement over the CIE 1931 system, they were not completely free of distortion. It can be seen that, given three real sources, these sources cannot cover the gamut of human vision. Geometrically stated, there are no three points within the gamut that form a triangle that includes the entire gamut; or more simply, the gamut of human vision is not a triangle. Light with a flat power spectrum in terms of wavelength (equal power in every 1 nm interval) corresponds to the point (x, y) = (1/3, 1/3). 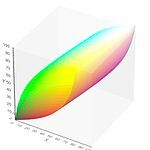 These formulas can be derived from the previously presented definitions of x and y chromaticity coordinates by taking advantage of the fact that the tristimulus values X, Y, and Z of the individual mixture components are directly additive. In place of the luminance values (L1, L2, etc.) one can alternatively use any other photometric quantity that is directly proportional to the tristimulus value Y (naturally meaning that Y itself can also be used as well). where L1 is the luminance of color x1,y1 and L2 the luminance of color x2,y2. Note that because ymix is unambiguously determined by xmix and vice versa, knowing just one or the other of them is enough for calculating the mixing ratio. Also note that, in accordance with the remarks concerning the formulas for xmix and ymix, the mixing ratio L1/L2 may well be expressed in terms of other photometric quantities than luminance. The CIE RGB color space is one of many RGB color spaces, distinguished by a particular set of monochromatic (single-wavelength) primary colors. In the 1920s, two independent experiments on human color perception were conducted by W. David Wright with ten observers, and John Guild with seven observers. Their results laid the foundation for the trichromatic CIE XYZ color space specification. Gamut of the CIE RGB primaries and location of primaries on the CIE 1931 xy chromaticity diagram. The experiments were conducted by using a circular split screen (a bipartite field) 2 degrees in diameter, which is the angular size of the human fovea. On one side a test color was projected while on the other an observer-adjustable color was projected. The adjustable color was a mixture of three primary colors, each with fixed chromaticity, but with adjustable brightness. The observer would alter the brightness of each of the three primary beams until a match to the test color was observed. Not all test colors could be matched using this technique. When this was the case, a variable amount of one of the primaries could be added to the test color, and a match with the remaining two primaries was carried out with the variable color spot. For these cases, the amount of the primary added to the test color was considered to be a negative value. In this way, the entire range of human color perception could be covered. 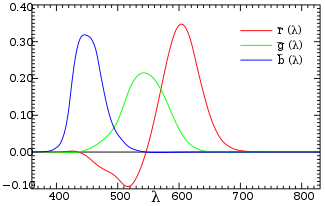 When the test colors were monochromatic, a plot could be made of the amount of each primary used as a function of the wavelength of the test color. These three functions are called the color matching functions for that particular experiment. The CIE 1931 RGB color matching functions. The color matching functions are the amounts of primaries needed to match the monochromatic test color at the wavelength shown on the horizontal scale. are zero at 700 nm, since in these cases the test color is one of the primaries. The primaries with wavelengths 546.1 nm and 435.8 nm were chosen because they are easily reproducible monochromatic lines of a mercury vapor discharge. The 700 nm wavelength, which in 1931 was difficult to reproduce as a monochromatic beam, was chosen because the eye's perception of color is rather unchanging at this wavelength, and therefore small errors in wavelength of this primary would have little effect on the results. The resulting normalized color matching functions are then scaled in the r:g:b ratio of 1:4.5907:0.0601 for source luminance and 72.0962:1.3791:1 for source radiance to reproduce the true color matching functions. By proposing that the primaries be standardized, the CIE established an international system of objective color notation. These are all inner products and can be thought of as a projection of an infinite-dimensional spectrum to a three-dimensional color. One might ask: "Why is it possible that Wright and Guild's results can be summarized using different primaries and different intensities from those actually used?" One might also ask: "What about the case when the test colors being matched are not monochromatic?" The answer to both of these questions lies in the (near) linearity of human color perception. This linearity is expressed in Grassmann's law. The sRGB gamut (left) and visible gamut under D65 illumination (right) projected within the CIEXYZ color space. X and Z are the horizontal axes; Y is the vertical axis. The sRGB gamut (left) and visible gamut under D65 illumination (right) projected within the CIExyY color space. x and y are the horizontal axes; Y is the vertical axis. Diagram in CIE rg chromaticity space showing the construction of the triangle specifying the CIE XYZ color space. The triangle Cb-Cg-Cr is just the xy = (0, 0), (0, 1), (1, 0) triangle in CIE xy chromaticity space. The line connecting Cb and Cr is the alychne. Notice that the spectral locus passes through rg = (0, 0) at 435.8 nm, through rg = (0, 1) at 546.1 nm and through rg = (1, 0) at 700 nm. Also, the equal energy point (E) is at rg = xy = (1/3, 1/3). The new color matching functions were to be everywhere greater than or equal to zero. In 1931, computations were done by hand or slide rule, and the specification of positive values was a useful computational simplification. color matching function would be exactly equal to the photopic luminous efficiency function V(λ) for the "CIE standard photopic observer". The luminance function describes the variation of perceived brightness with wavelength. The fact that the luminance function could be constructed by a linear combination of the RGB color matching functions was not guaranteed by any means but might be expected to be nearly true due to the near-linear nature of human sight. Again, the main reason for this requirement was computational simplification. For the constant energy white point, it was required that x = y = z = 1/3. By virtue of the definition of chromaticity and the requirement of positive values of x and y, it can be seen that the gamut of all colors will lie inside the triangle [1, 0], [0, 0], [0, 1]. It was required that the gamut fill this space practically completely. color matching function could be set to zero above 650 nm while remaining within the bounds of experimental error. For computational simplicity, it was specified that this would be so. The numbers in the conversion matrix below are exact, with the number of digits specified in CIE standards. The integrals of the XYZ color matching functions must all be equal by requirement 3 above, and this is set by the integral of the photopic luminous efficiency function by requirement 2 above. The tabulated sensitivity curves have a certain amount of arbitrariness in them. The shapes of the individual X, Y and Z sensitivity curves can be measured with a reasonable accuracy. 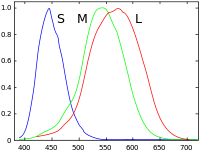 However, the overall luminosity curve (which in fact is a weighted sum of these three curves) is subjective, since it involves asking a test person whether two light sources have the same brightness, even if they are in completely different colors. Along the same lines, the relative magnitudes of the X, Y, and Z curves are arbitrary. Furthermore, one could define a valid color space with an X sensitivity curve that has twice the amplitude. This new color space would have a different shape. The sensitivity curves in the CIE 1931 and 1964 XYZ color spaces are scaled to have equal areas under the curves. ^ CIE (1932). Commission internationale de l'Eclairage proceedings, 1931. Cambridge: Cambridge University Press. ^ Smith, Thomas; Guild, John (1931–32). "The C.I.E. colorimetric standards and their use". Transactions of the Optical Society. 33 (3): 73–134. doi:10.1088/1475-4878/33/3/301. ^ a b Wright, William David (1928). "A re-determination of the trichromatic coefficients of the spectral colors". Transactions of the Optical Society. 30 (4): 141–164. doi:10.1088/1475-4878/30/4/301. ^ a b Guild, J. (1932). "The colorimetric properties of the spectrum". Philosophical Transactions of the Royal Society of London. Series A, Containing Papers of a Mathematical or Physical Character. 230: 149–187. doi:10.1098/rsta.1932.0005. JSTOR 91229. ^ Hunt, R. W. (1998). Measuring Colour (3rd ed.). England: Fountain Press. ISBN 0-86343-387-1. . See pgs. 39–46 for the basis in the physiology of the human eye of tripartite color models, and 54–7 for chromaticity coordinates. ^ Stiles, W. S.; Birch, J. M. (1959). "N.P.L. Colour-matching Investigation: Final Report (1958)". Optica Acta. 6 (1): 1–26. doi:10.1080/713826267. ^ Speranskaya, N. I. (1959). "Determination of spectrum color co-ordinates for twenty seven normal observers". Optics and Spectroscopy. 7: 424–428. ^ "CIE Free Documents for Download". Archived from the original on 2017-08-28. ^ Harris, A. C.; Weatherall, I. L. (September 1990). "Objective evaluation of color variation in the sand-burrowing beetle Chaerodes trachyscelides White (Coleoptera: Tenebrionidae) by instrumental determination of CIE LAB values". Journal of the Royal Society of New Zealand. The Royal Society of New Zealand. 20 (3): 253–259. doi:10.1080/03036758.1990.10416819. Archived from the original on 2017-03-08. ^ "Understand color science to maximize success with LEDs – part 2 – LEDs Magazine, Issue 7/2012". Archived from the original on 2017-11-11. ^ a b Fairman, H. S.; Brill, M. H.; Hemmendinger, H. (February 1997). "How the CIE 1931 Color-Matching Functions Were Derived from the Wright–Guild Data". Color Research and Application. 22 (1): 11–23. doi:10.1002/(SICI)1520-6378(199702)22:1<11::AID-COL4>3.0.CO;2-7. and Fairman, H. S.; Brill, M. H.; Hemmendinger, H. (August 1998). "Erratum: How the CIE 1931 Color-Matching Functions Were Derived from the Wright–Guild Data". Color Research and Application. 23 (4): 259–259. doi:10.1002/(SICI)1520-6378(199808)23:4<259::AID-COL18>3.0.CO;2-7. ^ CIE (1926). Commission internationale de l'éclairage proceedings, 1924. Cambridge: Cambridge University Press. Note that the 1924 luminous efficiency function seriously underestimates sensitivity at wavelengths below 460 nm, and has been supplemented with newer and more accurate luminosity curves; see Luminosity function#Improvements to the standard. Broadbent, Arthur D. (August 2004). "A critical review of the development of the CIE1931 RGB color-matching functions". Color Research & Applications. 29 (4): 267–272. doi:10.1002/col.20020. This article describes the development of the CIE1931 chromaticity coordinates and color-matching functions starting from the initial experimental data of W. D. Wright and J. Guild. Sufficient information is given to allow the reader to reproduce and verify the results obtained at each stage of the calculations and to analyze critically the procedures used. Unfortunately, some of the information required for the coordinate transformations was never published and the appended tables provide likely versions of that missing data. Trezona, Pat W. (2001). "Derivation of the 1964 CIE 10° XYZ Colour-Matching Functions and Their Applicability in Photometry". Color Research and Application. 26 (1): 67–75. doi:10.1002/1520-6378(200102)26:1<67::AID-COL7>3.0.CO;2-4. Introduction to Colour Science, William Andrew Steer. Annotated downloadable data tables, Andrew Stockman and Lindsay T. Sharpe.